Sun City Center offers models in a variety of different square footages to please any homeowner. Below are the newest homes available for purchase. This neighborhood of single-family homes is nestled amid lakes and golf holes of the Renaissance championship golf course. Residents of Siena will enjoy all the membership privileges of the 40,000-square-foot Club Renaissance including full-service spa, fine dining, fitness facilities, pool and more! This home features a spacious Great Room/Dining Room easily accessible from the open Kitchen, and the covered screened Lanai. The optional Den can easily convert to a third bedroom, home office or exercise room or hobby room. This floorplan is ideal for entertaining, which features 2 bedrooms, 2 baths & Den/Opt. Bedroom 3. The owner’s suite offers walk-in closet, double-vanity basins, and shower. This home offers a formal dining room, ideal for elegant entertaining. The den could easily convert to a convenient home office or 3rd bedroom. Master suite features 2 walk-in closets, double vanities, and walk-in shower. This split bedroom floor plan offers the owner’s suite great privacy. The centralized breakfast nook and kitchen offers access to the great room and spacious lanai. This spacious split bedroom floor plan features 2,043 a/c sq. ft., elegant Dining Room & Living Room, and eat-in kitchen area. Large Covered Screened Lanai is 22'4" x 14'5". Master Suite features 2 walk-in closets, doouble vanities, and shower. A/C Living Area: 2,043 Sq. Ft. Kitchen finishes include 3 cm granite counter tops with 4" backsplash; Designer Selected recessed panel wood; GE freestanding, smooth top, self-cleaning electric range; & GE microwave hood with eterior ventilation. Masster Bathroom finishes include water-saving dual-flush,comfort height elongated water closets; glass shower enclosures, corner shelf soad dish and tiled shower seats (per plan); & over-sized decorative medicine cabinets. A/C Living Area: 2,284 Sq. Ft. This neighborhood of attached villa homes is perfectly situated among golf course greens and conservation areas conveniently located near the 29,000 square-feet Kings Point South Club. Exceptionally well planned villa home features a master suite and an expansive great room accessing the corner lanai. Pricing reflects additional options, upgrades or designated homesite premium. This fabulous villa home features a centralized great room, expansive owner's suite and separate den. Pricing reflects additional options, upgrades or designated homesite premium. This spacious two-bedroom, two bath home has a separate den and large great room, perfect for entertaining. Pricing reflects additional options, upgrades or designated homesite premium. Simply sensational this spectacular 2 bedroom, 2 bath home with great room & dining room, plus a den is perfect in many ways. Ultra large rooms, gourmet kitchen, inside laundry room, 2 car garage & extras galore! A home for gracious living. Quality & elegance can be found throughout this exquisite 2 BR/2 BA home. Residence features a great room, dining room, open kitchen with breakfast bar, den, and inside laundry room. Professionally designed lush landscape package with fully sodded lot. Created to enjoy . . . this 3 bedroom home has a combination of great room/dining room for soft living and classic elegance & upgraded appliances in kitchen with breakfast bar. Master suite features walk-in closet, double vanities, private water closet and walk-in shower. A jewel to see! 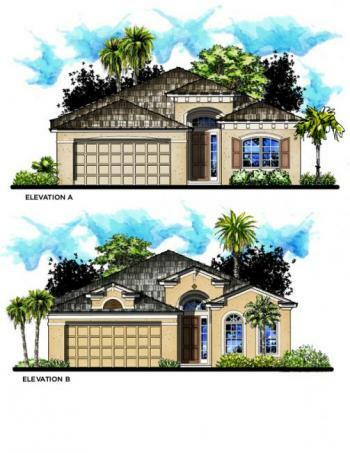 This neighborhood of single-family homes is ideally located on the northern edge of Sun City Center nestled amid the private Caloosa Greens Equity Golf Course. This floorplan features two bedrooms, den and an expansive great room with 1,479 square feet of living area. Whether entertaining or relaxing, the optional outdoor kitchen gives you the opportunity to bask in Florida’s fabulous weather. Pricing reflects additional options, upgrades or designated homesite premium. Living Area: 1,479 Sq. Ft. Entertain in the Jasmine that offers 1,731 square feet of living space with three bedrooms and an inviting great room. Or just simply relax in your luxurious owner's bath complete with garden tub, dual basins and separate shower. 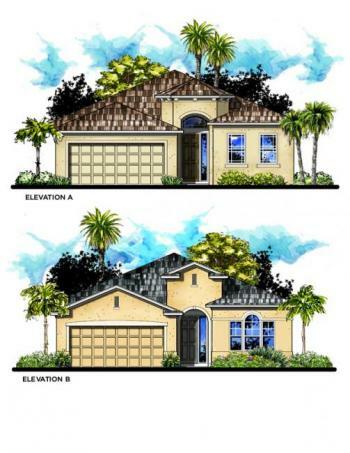 Pricing reflects additional options, upgrades or designated homesite premium. This neighborhood of villa homes in gated Kings Point is ideally situated amid beautiful golf greens and tranquil lakes in close proximity to the Kings Point South Club, for all your recreational needs. And with four exciting new floorplans from which to choose, Maplewood is ideal for the social butterfly and the nature lover, alike. This home’s great room and owner's suite can only be described as enormous. Both with easy access to the lanai, these rooms are the cornerstones of this grand home. The Chelsea features a centralized great room from which all other rooms lead. The den is ideal for a quiet retreat or can be easily converted into a third bedroom. Living Area: 1,551 Sq. Ft. This home’s owner's bath is its crown jewel. With a separate shower, garden tub and dual vanities, you’ll feel like royalty. The kitchen offers a built-in bar perfectly suited for casual dining. Living Area: 1,646 Sq. Ft. The two-story St. James is magnificent! The second-floor third bedroom is perfect as a guest suite with a complete bath, huge walk-in closet and a separate balcony. The first-floor features a delightful open courtyard as do all of the Kensington homes as well as a split-plan three-car garage. This neighborhood of 28 Club condominium homes is nestled between the eighth and ninth holes of the Renaissance championship golf course. With this spectacular location, residents will delight in the sweeping vistas of rolling greens and shimmering lakes. The first-floor Florenzia has three bedrooms, two baths and an elegant trayed-ceiling formal dining room. This home also presents a spectacular master suite. The trayed-ceiling lends an air of elegance immediately while the bath and spacious walk-in closet make for convenience and luxury. 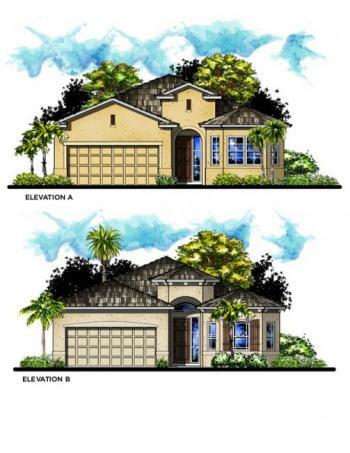 Pricing reflects additional options, upgrades or designated homesite premium. Living Area: 1,753 Sq. Ft. This second-floor residence offers three-bedrooms, two baths and a separate loft space, ideal for a retreat. The great room and formal dining room, in close proximity to the kitchen, offer perfect settings for dinner parties or a more casual social surrounding. And each Tavarnelle residence has an elevator for the comfort of you and your guests! Pricing reflects additional options, upgrades or designated homesite premium. Living Area: 2,326 Sq. Ft. This neighborhood of elegant estate homes is conveniently located near Club Renaissance, voted best club in America, and the championship Renaissance course. This home offers formal living and dining rooms lending sophistication to any gathering. The owner's suite offers privacy with the split bedroom plan while the two additional bedrooms are perfect for guests or a home office or gym. Living Area: 1,927 Sq. Ft. The Chantilly features magnificent architectural touches including a double-trayed owner's bedroom ceiling and unique entryway. The formal dining room and the breakfast nook offer casual or formal dining options. This spacious grand home allows for privacy with the split-plan design. Enjoy company, with room to spare, in the family room or living room. Breakfast nook within kitchen allows for cozy breakfasts. Living Area: 2,192 Sq. Ft. The spacious kitchen and breakfast nook serve perfectly as a gathering area with easy access to the family room, lanai, formal living room, formal dining room and three-car garage. Living Area: 2,497 Sq. Ft. This fabulous home’s first impression is one of simple elegance with the formal living room and dining room. 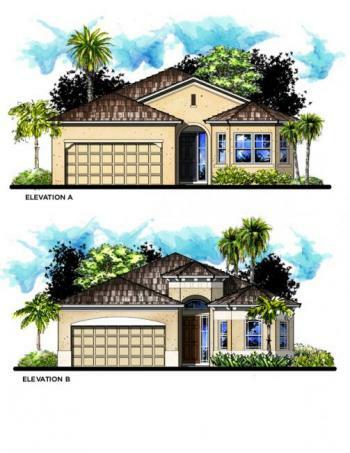 The split plan presents privacy in the grand owner's suite and the double lanais offer versatility in outdoor living. The impressive entry way passes through the vaulted ceiling foyer into the magnificent great room. The expansive master suite is perfectly complemented by the oversized lanai, separate formal dining room and separate parlor. Living Area: 3,085 Sq. Ft. This neighborhood of villa homes in gated Kings Point is ideally situated amid beautiful golf greens and tranquil lakes in close proximity to the Kings Point South Club, for all your recreational needs. And with three exciting new floorplans from which to choose, Kensington is ideal for the social butterfly and the nature lover, alike. The Chelsea features a centralized great room from which all other rooms lead. The den is ideal for a quiet retreat or can be easily converted into a third bedroom. Pricing reflects additional options, upgrades or designated homesite premium. The two-story St. James is magnificent! The second-floor third bedroom is perfect as a guest suite with a complete bath, huge walk-in closet and a separate balcony. The first-floor features a delightful open courtyard as do all of the Kensington homes as well as a two-car garage. 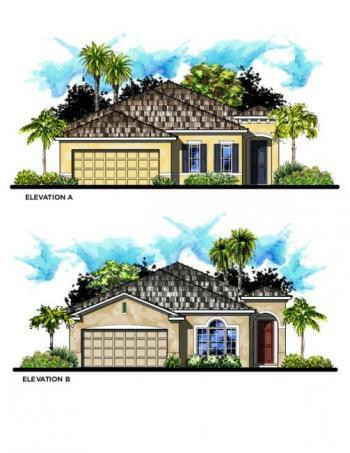 Pricing reflects additional options, upgrades or designated homesite premium. Living Area: 2,051 Sq. Ft. This neighborhood of single-family homes is nestled amid lakes and golf holes of the Renaissance championship golf course. Residents of Bayonne II will enjoy all the membership privileges of the newly opened 40,000-square-foot Club Renaissance including full-service spa, fine dining, fitness facilities, pool and more! This floorplan features two bedrooms, den and a generous great room. The owner's suite offers walk-in closet, double-vanity basins, private water closet, garden tub and shower. 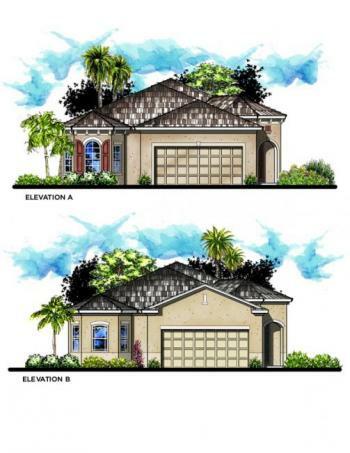 Pricing reflects additional upgrades, options and designated homesite premium. Living Area: 1,478 Sq. Ft.